First Thing To Leave/Break on Gatekeeper? I'm mostly an optimistic person when it comes to CP...But I can't quite help to wonder what the first thing to leave or break with Gatekeeper will be? The reason I ask, it because lately CP has had quite a bad record when it comes to new rides. all dating back Mantis and later. Mforce wheel problems (and logo change), Top Thrill train theme broke (and train design change, again and again), Maverick lost it's heart line roll (and some say theme elements), Windseeker (broke for awhile, but had sway seat issues), Shoot the Rapids boat issues, Mantis (I'm not sure if the name counts) but in it's later years it lost a train, etc. These things are all to be expected. Look at Hershey: Fahrenheit valleyed the day before it was supposed to open. Skyrush was open for less than a full season and was shut down (rumors were there were axle issues that could have been catastrophic), and heck, they had a contract for a coaster that never went up! There are quite a few Wing Riders in operation already. Cedar Point isn't breaking new ground with this one. Yes, it's a bit taller than the others, but this is B&M we're talking about here -- it'll be reliable. Yeah it is. The park has nothing to do with the issues of previous rides, Intamin does. Mantis didn't "lose" a train, they determined there was no value in running it because of load times. Gatekeeper is going to be built by B&M, so I wouldn't worry about anything happening to it. BTW it's pretty obvious that Intamin is responsible for whatever you mentioned, not CP. B&M builds some of the most reliable rides on the planet. I'm not really aware of Raptor or Mantis having any significant reliability issues. Most of the rides you mentioned were made by Intamin, not B&M. I'm sure Gatekeeper will have some minor issues, I think the odds are very good that it will open on opening day and run every day the park is open. When did they change Millennium Force's logo? And what does it have to do with reliability? ^^ I do not see reliability mentioned once in the topic. Think he was just talking about luck. And yes, as stated, this is nothing about reliablity, or seriousness, it's just more about what are the odds of luck. "﻿The Frontier trail tunnel hasn't always been there?﻿﻿﻿"
There is a short tunnel under Mforce on the frontier trail, which was basically built to keep people who are walking under the coaster from getting pelted with loose objects. I'm not sure exactly when it was put in. But, I think it was there when I went in 2010. I was also there on M-forces first year of operation, when they were talking 7 hour lines, with people backed up all the way into frontier town. I don't believe there was a tunnel under the coaster then. Are you talking about the cave structure under where MF enters and exits the island? That has been there since the ride was built. It was part of the ride's design. My prediction? The first thing to leave or break from Gatekeeper is going to be the lights on the train. I agree with Jeff. Intamin does not have a good track record when it comes to ride maintenance. 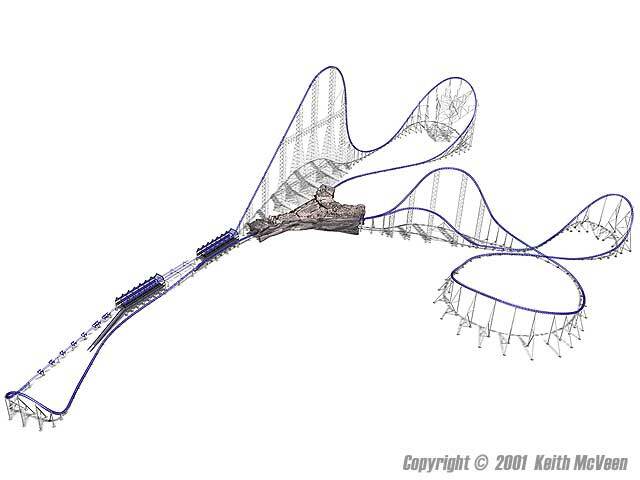 The only thing I foresee is possibly Gatekeeper getting stuck on the lift hill or in the break run. B&M is just more reliable than Intamin. I try not to think about the "what could go wrong's"....The glass is half full! A Google Images search turned up this image which shows the tunnel as part of the design. it does not appear to show a midway tunnel. It does show some tunnels, but it appears that you can see the midway underneath the track as the tunnels stop just before crossing the midway. I wonder when they decided to add the tunnel?